President Maithripala Sirisena looks on during an Independence Day parade, Colombo, Sri Lanka, Feb. 4, 2016 (AP photo by Eranga Jayawardena). In this week’s Trend Lines podcast, WPR’s senior editor, Frederick Deknatel, and associate editors, Robbie Corey-Boulet and Omar Rahman, discuss the recent cut in U.S. aid to Egypt and what’s behind French President Emmanuel Macron’s outreach to Africa. 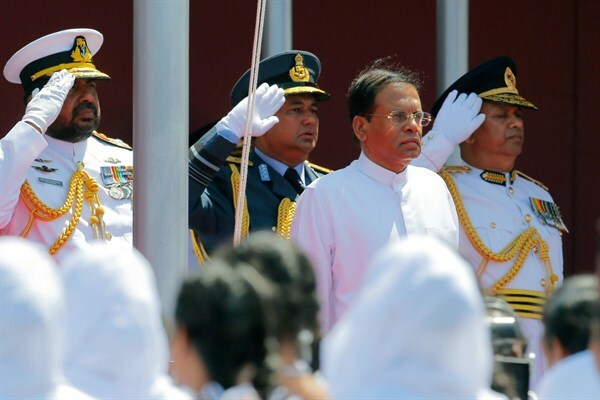 For the Report, Shreen Saroor and Mytili Bala talk with Peter Dörrie about stalled transitional justice in Sri Lanka and the fate of thousands of people who were abducted or disappeared before, during and after the country’s long civil war. Should Somalia Prosecute or Offer Amnesty to Al-Shabab Leaders Who Surrender?